Batch mixers have been around for a long time, yet many aspects of their design and application are not well known. While off-the-self designs are safe bets for conventional applications, it takes judgement to pick the right mixer for a new application. The wrong choice carries high costs in terms of time, money and user satisfaction. Computational fluid dynamics (CFD), the use of high-level math to predict mixer performance and quantify design options, promises to simplify those choices. Once restricted to universities and research laboratories, easy-to-use CFD software is now showing up on desktops in engineering firms and plants. Although batch mixers will break down solids and mix dissimilar substances, they are most commonly used in low-shear applications to gently blend similar liquids. In essence, mixing keeps vessel concentration or temperature within a constant range. For this reason, batch mixers are also known as agitators. Mixers sometimes act as reactors. The mixing action keeps solid granular catalysts in suspension while gases blanket the liquid from above. The swirling mixer blades induce the gases into the liquid and keep them evenly dispersed as they react with the catalyst. CFD uses high-level mathematics to solve transport problems, especially fluid flow. Due to the nature of fluid flow in chemical processes, however, CFD often considers mass transfer and heat transfer simultaneously. The software does not solve problems analytically, but numerically, using a tremendous number of calculations. 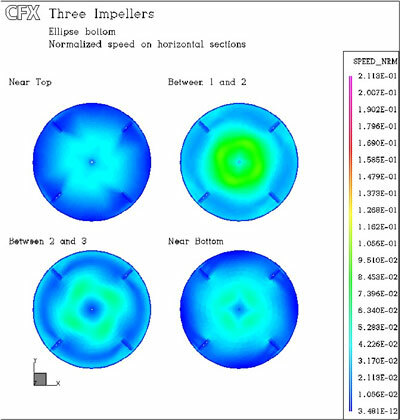 CFD uses numerical analysis to solve finite differences, finite elements, iterative techniques, matrix operations, and other complicated chemical process problems. While the techniques often prove slippery to grasp, this idealized one-dimensional example gives showcases how CFD works. Also assume the following boundary conditions: y(0)=0 and y(1)=0. One way to solve this problem is to use finite differences to break the differentials -- by definition, infinitesimally small--into small, measurable pieces. Finite differences solves Equation 1 in two steps. First, the domain (the range of "x" over which the solution is found) is divided into "n" segments. In between each segment, is a node. There are a total of "n+1" nodes. Secondly, Equation 1 is transformed using finite differences. The following assumption is made about the second order differential. Equation 2 is now substituted into Equation 1 and the final finite difference equation is derived. Equation 3 is now applied and solved for every node point "i" on the domain, For each value "x," the equation yields a corresponding solution for "y." The only problem, as Equation 3 shows, is that the value of "y" is dependent on the value of "y" at the node ahead of it and behind it. Therefore, Equation 3 must be applied independently to each node point. This generates a system of linear algebraic equations that must be solved simultaneously. The number of equations is usually about n+1, depending on the type of boundary conditions applied. Almost always, these systems produce a tri-diagonal matrix that can be solved by a special routine for solving tri-diagonal matrices called the "Thomas Routine." The grid of n+1 nodes can be adjusted to fit the needs of a particular problem. Some differential equations are "stiff" (the solution has steep gradients) and require many node points. Others are not, and can be solved with fewer nodes. Extrapolating the system of nodes to a three dimensional system lets engineers solve fluid dynamics problems within stirred tanks. The approach models the interior of the tank as a 3D web of nodes, commonly referred to as a grid or a mesh. The example illustrates the complexity of CFD. Although this example uses finite differences, it could also use finite elements. Different problems and boundary conditions could produce a system of nonlinear algebraic equations that require an iterative solution. No matter, CFD attempts to model the problem through application of number-crunching muscle. 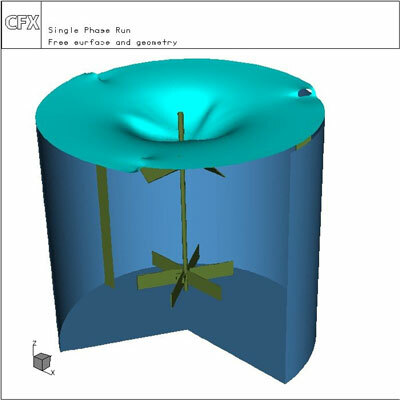 CFD enables engineers to predict fluid flow within a tank. This allows users to complete detailed design with greater certainty. Design engineers are especially interested in eddies, general flow patterns, turbulence, dead zones, cavitation, mass transfer rates, and diffusion. They can use the information to determine such important design parameters as blade size, blade type, number of blades, blade spacing, baffle configuration, blade submergence:diameter ratio, and tank diameter:blade diameter ratio, to name just a few. CFD's most important feature may be its ability to model design performance before cutting steel. Engineers can run and test new approaches on their desktop before taking any experimental data. CFD's fundamental approach makes its extraordinarily precise in mixer performance prediction. Equally important, it enables designers to accurately project scaleup performance and pinpoint design flaws before going into production. This shortens lead times, reduces prototype builds, and offers rich insights into novel designs often considered too expensive to investigate. CFD has been around since the early 1970s. It took another decade for the first commercial CFD simulator to reach market. CFD systems has come a long way since then. Today's software are far very easy to use and generate powerful results. CFX-ProMixus by AEA Technology Engineering Software (Pittsburgh, PA) exemplifies the trend. It greatly simplifies modeling of batch mixing systems. 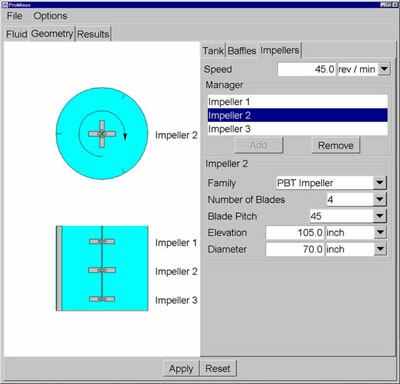 The engineer simply selects from a library of templates (see Figure 2) for tanks, baffles, and impeller configurations. Models can be developed from a library of geometrical templates. The software integrates the geometrical configurations into a packaged solution. It then quantifies mixing results in a gallery of graphics and tables (see Figure 3). Results are placed in easy to access galleries. In addition, it uses colors to visualize the information, so engineers can see where heat builds up or cavities form (see Figure 4). Clear graphical results produced by CFX-ProMixus. CFX-ProMixus links to other AEA software, including the Hysys dynamic process simulator and Basys batch process simulator. This enables engineers to use a ProMixus mixer model to create complete process simulations in Hysys or analyze heat transfer, reaction kinetics, crystallization, and other reaction variables in Basys. "In the past, CFD was only available on a research level because of hardware issues, but also because of the extensive expertise needed to run the software," says Glenn Smith of AEA Technology Engineering Software in Waterloo, ON, Canada. "General-purpose CFD software applications often take specialists days or even weeks to complete. Understandably, most companies cannot rationalize this type of expense outside of an R&D context. "Our new approach to CFD is to increase the accessibility and diminish the time requirement through the provision of a web-enabled interface for specific applications. These new tools can either be a launching point for an expert or a solution for the engineer with limited knowledge," says Smith. Fluent Inc. (Lebanon, NH) is another leading provider of CFD software. Its suite of software includes MixSim, a program designed to apply CFD to mixing applications. For more information: AEA Technology Engineering Software, 554 Parkside Dr., Waterloo, Ontario N2L 5Z4, Canada. Phone: 519-886-8435. Fax: 519-886-7580. By Richard Carranza, Editor/Consultant, Lisle, IL. Phone/Fax: 630- 322-8995. E-mail: richard_carranza@msn.com.